High intensity interval training (HIIT) is absolutely amazing because it is very time efficient and your body will continue to burn calories even after you are done working out! Think about when you are on the elliptical machine, at the same pace, for a prolonged period of time. Your body gets used to this state and is not really challenging your body or doing anything for your body outside of the workout. In fact, I see a lot of people on their phones or even reading while on the elliptical machine. You should be working too hard to do either of those. If you think you do not have time to work out, you’re wrong! Tabata interval training (a form of HIIT) takes, at minimum, 4 minutes! We ALL have 4 minutes. 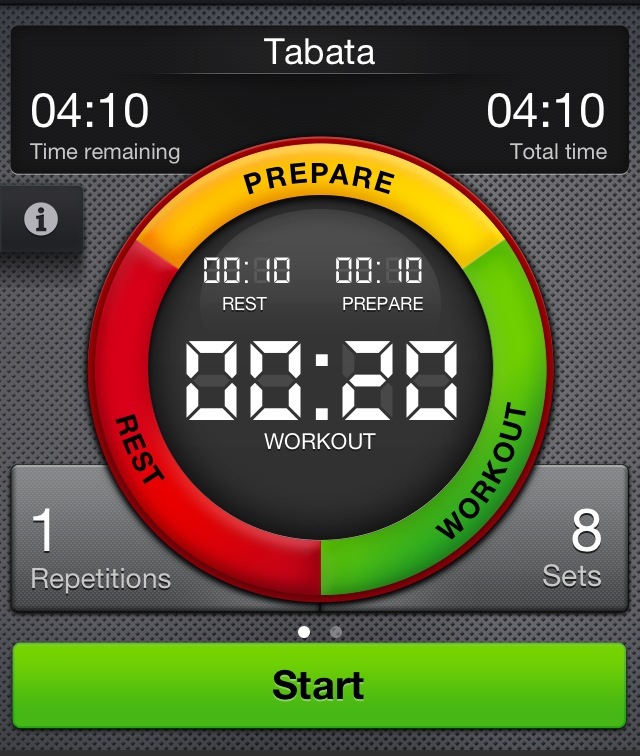 A true Tabata is 20 seconds of high intensity exercise, followed by 10 seconds of rest. This interval is repeated for 8 rounds, or a duration of 4 minutes. However, do not be fooled—this is the hardest 4 minutes of workout in your life. During this 20 seconds, you are going as hard as you possibly can without breaking form, of course. I first heard about Tabata when I was at Crossfit with my mom and we did a Tabata interval as our final “cash out” with jumping rope. It was really intense, and really AWESOME! So, I started incorporating that specific type of interval into my own workout as well as my clients. I have now become a certified Tabata Bootcamp Instructor and have seen how awesome and effective this type of training can be. I learned you can use strength training, mixed with cardio intervals to get the most out of your Tabata training. Keep in mind: A Tabata can have 1 exercise (performed for 8 rounds); 2 exercises (4 rounds); or 4 exercises (2 rounds). You can blast fat, build endurance and target upper, lower, core or total body with a Tabata workout. Book your 30 minute Tabata workout with me today. The Runtastic Timer App is really awesome because it makes training in short intervals like Tabata much more effective when you don’t have to stare at your watch or pay attention to time. 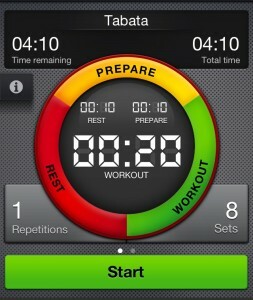 The Timer app will talk you through the intervals and let you know when it is time to workout and rest. Click HERE to get the Runtastic Time App. a. Plank Jack: Start out in a proper plank position on your hands and toes, feet together. Keeping your abs tight. hips stable (no butts up in the air or sagging too low), jump your feet out and in like you would do in a jumping jack. b. Squat & Twist: Start out with your feet hips width a part, toes forward and hands behind your head. Keep your abs engaged and chest up as you lower into a squat. As you are coming out of the squat and returning to a standing position, lift up your right knee at a diagonal while simultaneously twisting your upper body, and left elbow toward the direction of the knee. Do not hunch over to get your elbow to touch your knee. It is the knees job to meet the elbow. Don’t worry if you cannot get your knee too high– it takes practice. Repeat with the left knee and right elbow. a. Lunge & Twist: Start off in a standing position with your hands in a goal post, palms facing forward. Step back into a lunge with your right foot. Once you are in the lunge position, twist your torso and rotate your upper body towards to the left- keeping that goal post position with your arms. Untwist and return to your upper body to center, push through the left heel and return the right foot up to a standing position. Repeat on the other side. a. Side-Step plank: Start in a proper plank position on your hands and toes. Keep your abs tight and body straight as a board while stepping out your right hand and right foot towards the right. Then bring your left hand and left foot to the right to resume a proper plank position. Do this 3 times towards the right before switching to the left. b. Switch Lunges: Start off in a lunge position with your hands on your hips. Lower down a little bit in order to gain some momentum and then explode up into the air, switch your legs and land into a lunge on the other side. Try to make these as quick and powerful as possible. If these are too difficult, go with regular lunges and work your way up.